The Clamp Divinity School is named in honor of the man whose gift made the school possible. Though he did not live to see the school established, those who study in the Master of Ministry program stand on the foundation that he built through his sacrificial commitment to the cause of equipping church leaders. 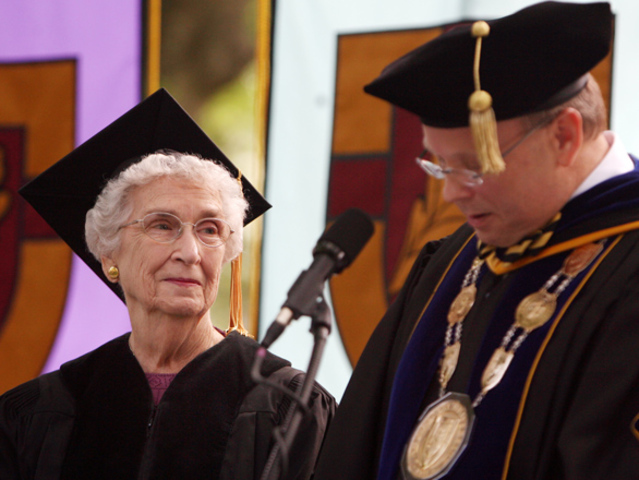 The following comments were shared by President Evans Whitaker at the Spring 2009 commencement ceremony, when honorary Doctor of Humanities degrees were presented to David T. Clamp (posthumously) and to his widow, Jane Ferguson Clamp (featured image from the Anderson Independent Mail). “David’s journey began on a humble cotton farm in the nearby community of Honea Path. One of eight children, he worked faithfully on the farm, but found he had a gift for managing numbers, and with great attention to detail. That gift served him well in World War II as a member of the United States Army. After his years of military service he entered Pace University in New York City and eventually graduated with a degree in business administration. With strong educational credentials in hand, he promptly began a career in Civil Aeronautics. He rose through the ranks of the U.S. Civil Aeronautics Board, where he traveled the country auditing U.S. air carriers and evaluating their operations. He retired in 1972 and continued to enjoy traveling from his home base in Waynesboro, Virginia. Using his sharp eye for numbers, he carefully managed the personal assets he had managed to accumulate and grew a substantial portfolio he knew he would eventually leave behind for Christian work. David’s partner on the second half of his journey in life was his beloved wife Jane Bodkin Ferguson Clamp, one of six children of William Henry Bodkin and Mary Johnston Bodkin of Uniontown, Pennsylvania. The two had worked together at the Civil Aeronautics Board. Some years after each retired and after the passing of each of their first spouses, they renewed their acquaintance at a Christmas party for retires of the Board in 1997, which, according to Mrs. Clamp, culminated in their marriage on March 25th of a cotton-picking son and a coal miner’s daughter. Mrs. Clamp, a long time civil servant herself, began her career with the FBI and retired from the Civil Aeronautics Board as an Administrative Officer with the Bureau of Accounts and Statistics. Jane loved her husband faithfully and worked joyfully in their church, the First Baptist Church of Waynesboro, Virginia, where she plays a significant role today. She has also been a parliamentarian and former member of International Training in Communication (formerly The International Toastmistress Club). She supports Habitat for Humanity and the Augusta Free Clinic in Fishersville, Virginia. When Alzheimer’s disease began to attack David’s health, Jane cared for him beautifully. At the right time, she stepped in to carry David’s commitment forward as though she herself had always loved Anderson University, which, as she will tell you today, she does. The graduate program in Christian ministry that David so lovingly planned and nurtured is now a reality at Anderson University. . . . Through this program, countless men and women will be equipped for church leadership, missions, and evangelism. Through its graduates, people will be encouraged and strengthened to live lives of Christian devotion and service. Through its graduates on mission, the needy will be encouraged, the naked will be clothed, and the hungry will be fed. And through its graduates, this very world that groans for redemption will hear about the greatest story ever told – the story of the birth, death, and resurrection of the Lord Jesus Christ and of the greatest gift ever given to humanity – the gift of salvation and eternal life through Him. Master of Ministry | M.MIN. The Master of Ministry degree is streamlined 42-hour graduate degree designed for ministerial training. It is appropriate for those in ministry who are ready for advanced study and persons entering ministry who seek an effective preparation for hands-on ministry service. The program will also be of value for committed lay leaders in the church who seek to advance their capacity and preparation for service. Master of Divinity | M.DIV. The Master of Divinity is the industry standard for graduate theological education. The M.Div. focuses on the core competencies of pastoral ministry, with an emphasis on leadership, communication, biblical studies, evangelism, and church health. The Clamp Divinity School M.Div. is a 75-hour degree program that offers great flexibility, combined with academic excellence and equipping for effective kingdom service. Doctor of Ministry | D.MIN. The D.Min. in Biblical Preaching is a program specifically designed to help pastors and church leaders take their proclamation of the gospel to the next level. Today’s churches need leaders who are effective communicators. Our seasoned professors will guide students through a series of week-long seminars and directed ministry to enhance their understanding of biblical preaching.